Take your average hedgehog, expand it to the size of a beach ball, then plate it in armored scales, give it a long, sticky tongue and a thick tail, and you’ve got yourself a pangolin (well, more or less). Dr. Seuss himself would have had a hard time dreaming up this creature. But the weird and wonderful pangolin isn’t a storybook creation. It’s a real-life animal, and it’s the most-trafficked mammal in the world. Humans poach more pangolins than rhinos, elephants, and tigers combined, and, like their bigger cousins, they’re being driven to the edge of extinction. In fact, nearly a million individuals were traded illegally over the past ten years, despite a ban on international trade that covers the four Asian species of pangolins (another four species live in Africa and are mostly unprotected). These animals are highly coveted for their meat and scales (which are used in traditional Asian medicine) mostly in Vietnam and China, and the U.S. represents another major market for pangolin parts and directly contributes to the crisis facing the species. In response to pangolins’ rapidly declining numbers, we at the International Fund for Animal Welfare (IFAW), along with the American and Vietnamese governments and a coalition of wildlife conservation groups including Humane Society International, FREELAND Foundation, and the Natural Resources Defense Council, organized the First Pangolin Range States Meeting in the steamy coastal city of Da Nang, Vietnam. Representatives from 29 African and Asian pangolin range countries (where the animals still have habitat) gathered for the three-day workshop to address this urgent wildlife issue and discuss conservation strategies. These key stakeholders have one overarching goal: affording pangolins the protections they so desperately need. The conference was loaded with information and a sense of urgency. We heard from leading scientists like Nguyen Van Thai, Lisa Hywood, and Dr. Leanne Wicker, who described the unique traits and gentle nature of this incredible species; from environmental ministers of nations as far-flung as Botswana, China, and Nigeria; and from trade experts at the CITES Secretariat and international NGOs. In any diplomatic setting, people have different opinions about the best way to reach a goal, and this one was no different – but after days of sometimes-contentious debate, the delegates agreed that the international trade ban needs to be expanded to cover all eight pangolin species. We’ll have our first chance to do this at next year’s “Conference of the Parties” to CITES, the international treaty governing wildlife trade, in South Africa. 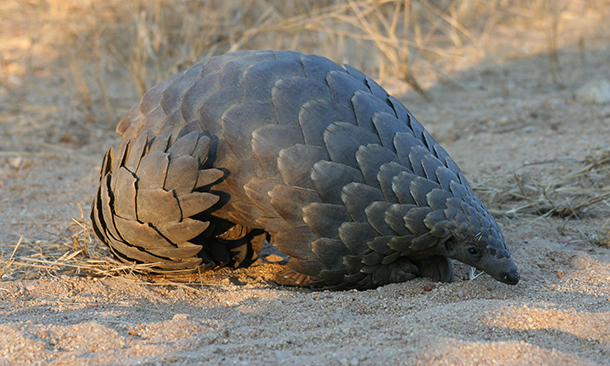 IFAW’s Asia and Africa regional offices have spent years protecting wildlife habitat on those continents and leading campaigns to reduce demand for wildlife parts and products, including pangolins, and an “uplisting” under CITES would be a major accomplishment. We are proud to be an organizing partner and are optimistic that this meeting is a positive sign of things to come; in order to save pangolins, government agencies, NGOs and wildlife conservation organizations will need to work together. We must not sit idly by as one of nature’s most unique creatures is driven to extinction by unsustainable human consumption.